We were on the ledge. The Going-to-the-Sun Road was a dizzying 100 feet below us. I tried to exude confidence, but I was, in fact, a little nervous. 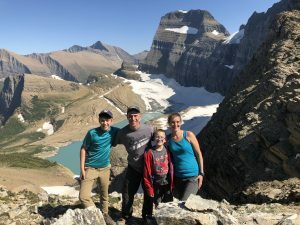 We were on the first mile of our hike on the famous Highline Trail at Glacier National Park in Montana. The ledge was only 6 feet wide, and it wound its way for over a quarter of a mile in front of us. 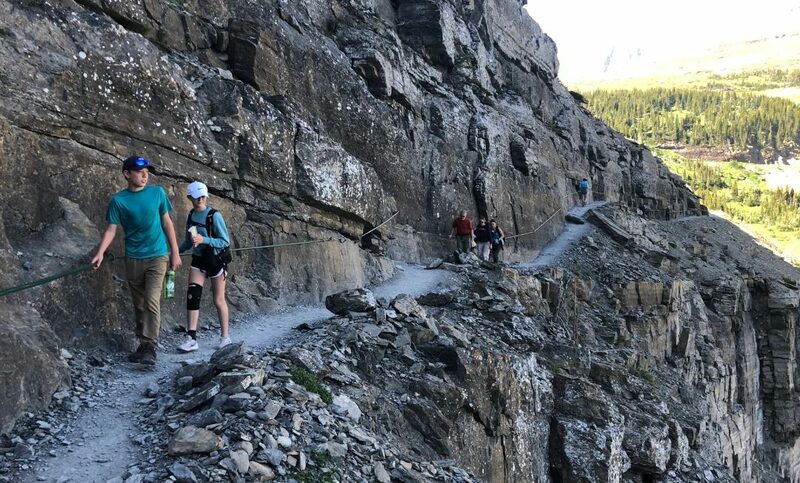 To our right was a sheer granite cliff, and the Park Service had helpfully attached a heavy steel cable, which I was gripping rather tightly as I made my way forward. To our left was a spectacular panoramic view of mountain peaks and deep valleys, which I was determinedly ignoring for fear of losing my footing and plummeting to my grizzly death. My thoughts shifted to my son Elijah, who was making his way along the ledge behind me. He had a paralyzing fear of heights since he was a young boy. I remember him trying to climb viewing platforms at various state parks on previous family trips, and he always turned back before reaching the second or third flight of stairs. He was now 13, and I knew he had been working to overcome his fear of heights. But this was something else entirely. This was a cliff, and there were loose rocks along the trail. I gripped tightly to the hand cable and glanced back at him. He looked up and smiledat me. What the heck was going on? He looked more confident than I felt. I turned back around and continued along the trail, wondering what had happened to my son. We arrived at a more reasonable section of the trail, and I pulled up next to him, asking him about his experience on the ledge. He admitted that he was a little nervous, but he knew he could handle it. He reminded me that he tried high ropes for the first time at camp earlier in the summer. I thought back to his camp experience. He went to Luther Park in Chetek, WI this year. Before that, he had been to my home camp for 5 consecutive summers. But his church confirmation group was going to Luther Park, so he had to try out a new camp. I remember driving him home from camp. Since I study camp experiences, I am always on the lookout for those exceptional experiences where a camper shows marked growth in self-confidence, faith, leadership, and other outcomes. Elijah did not show signs of a particularly remarkable experience in the days and weeks following camp at Luther Park. I was pleased that he had fun, but I did not notice any significant changes until 6 weeks later, when we were on the Highline Trail. As we hiked, we talked again about his experience at Luther Park. He told me all about the high ropes course. There were other boys in his cabin who also had a fear of heights, but each of them climbed to the top of the course and negotiated the challenge elements. In this way, they helped each other overcome their fears. He told me about some of the other things he did for the first time at Luther Park, including paddle boarding, which he really enjoyed. As we walked and talked, I wondered anew at the power of the camp experience. Some impacts are not apparent right away. It can sometimes take weeks, months, or even years for impacts of the camp experience to manifest in everyday life. For Elijah, attending a new camp provided a novel experience with unique opportunities for growth. In the Effective Camp Project, 95% of campers agreed that they tried something new at camp. One question we ask every year on the camper survey is how much they agree with, “I like going out of my comfort zone and trying new things.” From the first day to the last day of camp, this is one of the items where we see the most growth in agreement level. One of the great benefits of the camp experience is often increased self-confidence and being comfortable trying something new. We had a great hike along the Highline Trail. It was, hands down, the most spectacular hike I have ever been on. We saw mountain goats, stunning views, and an incredible overlook of Grinnell Glacier. The highlight of the hike for me, though, was seeing the growth in my son, nurtured with a great experience at Luther Park Bible Camp. God works wonders through great Bible camps! What a great story. I’ve been on that trail myself. It’s amazing. The next hike you’ll all enjoy is Angel’s Landing at Zion. 1500 feet down on both sides of a 5′ wide trail with a chain to hold onto. As a high adventure adrenaline junkie most of this stuff is fun for me, but not frightening. Angel’s Landing, however, got my full attention. And isn’t that the joy of camp and adventure. One person’s adrenaline fix, is another persons new growing edge. I would argue that in the long run, adrenaline is a quick rush, but the things that really change us and stick with us are those challenges when we know we need the support of the community around us. Be it a cliff hanging hike, or the first night away from home in a tent or camper cabin. How great it is our camps offer both.